I would like to correct an error I made in today’s post. 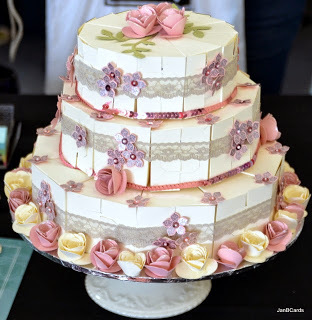 The cake was actually made from scratch by Stampin’ Up! demonstrator Michelle Philips, before she knew SU were bringing out a die that will do almost the same. Had I paid more attention, I should have seen that Michelle’s cake has three layers and the SU cake has two. Please accept my sincere apologies for my mistake, Michelle, and congratulations on creating an absolute masterpiece – it’s stunning.